Having tried and failed many, many times over the years to meditate I was beyond grateful when Dr Eben Alexander suggested sacred acoustics via his colleague Karen Newell. The first challenge was finding the time and peace and quiet. Not easy if you are busy or live in a noisy household. The second challenge is trying not to giggle at myself when I switched the tape on and heard the omm like sounds. The third challenge is not falling asleep. The fourth challenge, if I manage to stay awake, is not thinking about all the things I should be doing but aren’t doing because I am lying down and trying to meditate. At first, it really did feel like I was trying to meditate as it doesn’t come naturally to me at all because I’m a natural born fidget and my mind always racing with ideas. However – and this is exciting – after a while the sacred tones really started to absorb me. I found myself drawn into a sound world somehow like a vortex. I was grateful to Karen’s calming voice offering gentle suggestions along the way as that gave me a point of focus or visualisation. In time though I wasn’t visualising anything. It was all about the sound. I felt in one moment that I had stepped inside the sound, if that doesn’t sound too strange. I think I lost time once (which probably means I fell asleep) and towards the end instead of images, feelings and thoughts there was total nothingness. Like a dark but blank canvas. This was a bit frightening initially but also liberating. I was there but I wasn’t there. I was outside myself. As the tape came to an end I felt a little reluctant to open my eyes and go back to reality. When I did open my eyes instead of feeling groggy as I expected I was wide awake. Was that because I had had a power nap or was it because I had entered into another realm of consciousness? I really don’t know the answer to that yet but look forward to continuing my meditation journey tomorrow and seeing if any answers, insights and images emerge and I begin to understand why so many psychics, spiritualists, gurus, mystics, experts etc wholeheartedly recommend meditation as essential for spiritual development. My PR and marketing assistant Kim is also going to try this meditation this evening. Like me, Kim lives a very busy life and said that she’s only once been able to meditate properly before, when she joined a group meditation with Richard Holmes and in it met up with her mother who had passed away and they sat and chatted on a park bench in the countryside. She said that when she came out of the meditation she had tears streaming down her face and was a little embarrassed but when she opened her eyes many others in the group were in a similar situation. 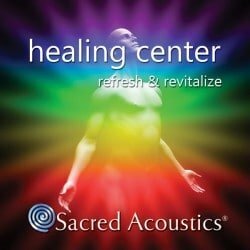 Kim is going to blog about her experience with sacred acoustics when she has tried it later.